Igloo tent – an exclusive shelter with a 360° panoramic view . 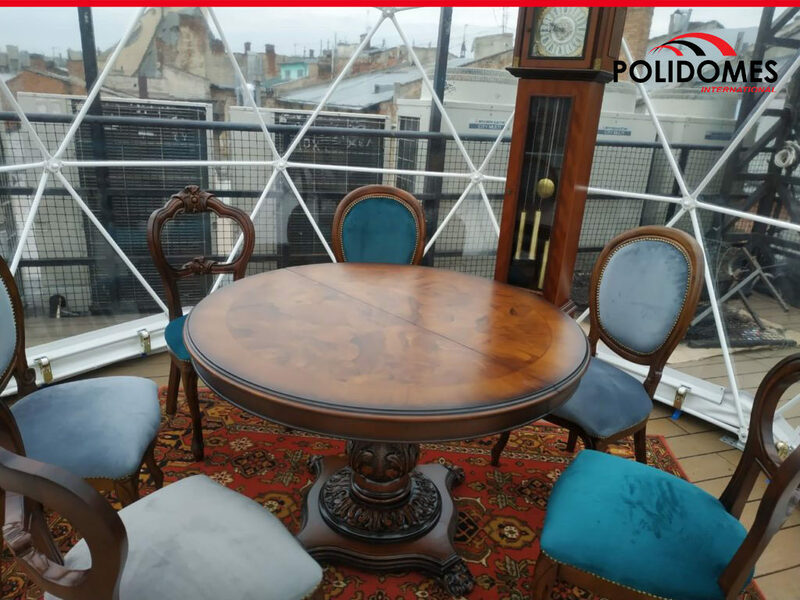 As Polidomes company is the manufacturer of the geodesic structure, we always admit that we have no limits. On the client’s request, we are able to produce customized, unique dome tent. 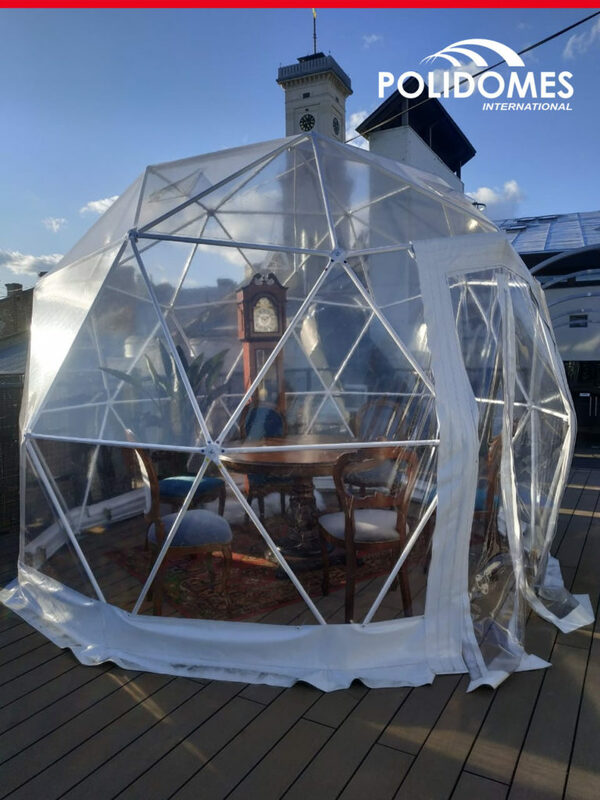 This time on the demand of famous Lviv’s restaurant network Polidomes has implemented a solution and it is the transparent rooftop igloos that will provide visitors a unique and magical rooftop winter experiences! iFest Lokal is the company located in Lviv – the city nominated in Top 100 City Destinations 2018 by Euromonitor International! It was a pure pleasure for Polidomes team to cooperate with such a creative and ambitious company! These guys implement only the freshest ideas into the sensation of the restaurant market. Polidomes geodesic structures were the best match implementing iFest’ creative ideas for the launch of another knockout restaurant location. 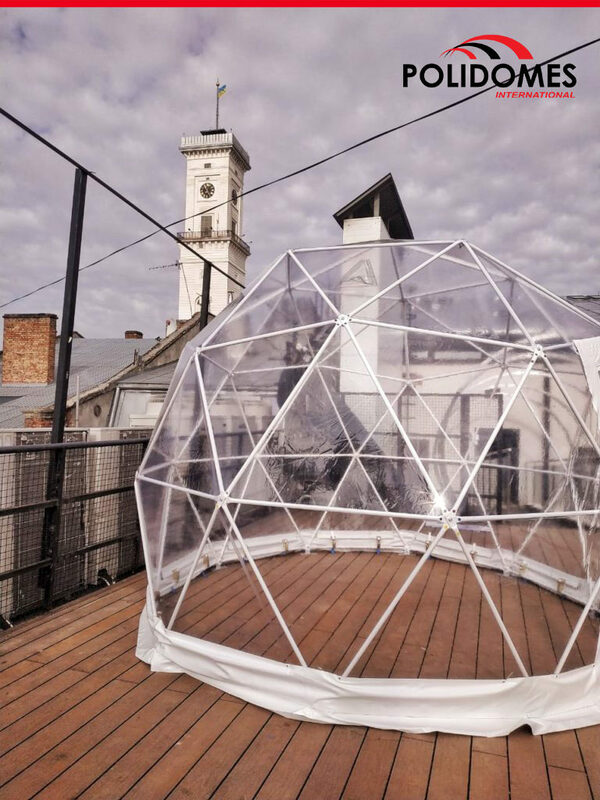 The mission was not easy, because the igloo placed on the rooftop should be able to withstand the rough Lviv weather with frosty and snowy winter along with the strong wind. At the same time, igloo tents should be safe and completely transparent, allowing visitors to enjoy the panoramic view over the city with a drink in their hand. A rooftop bar location is just a handful of places where you can view the surrounding city from a top and experience the sky up close and personal. 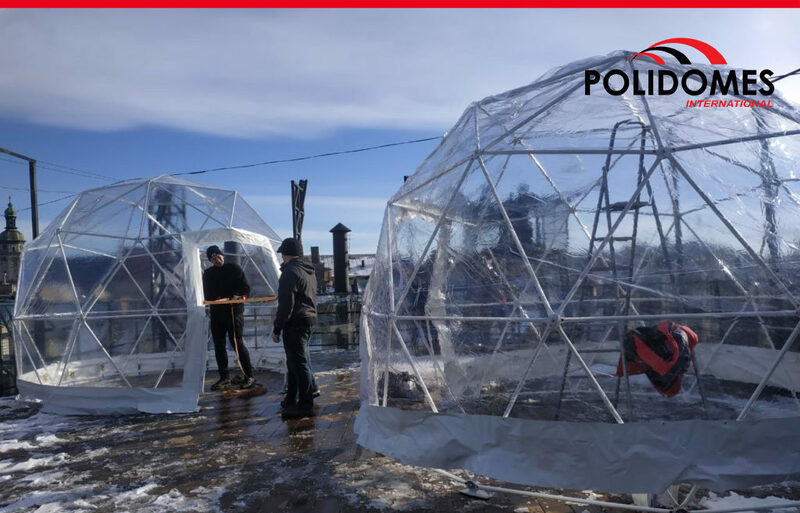 Design of the Polidomes transparent dome tent is intended to deliver an exclusive shelter with a 360° panoramic view to best exploit the potential of an outdoor rooftop or a terrace during the cold seasons. Because of being the small size igloo, which is 3,6 m in diameter – these transparent igloo tents are really affordable and low cost remaining safe, stable and attractive. We offer restaurant’s outdoor rooftops and terraces a covered and heated shelter that doesn’t spoil the panoramic view due to its completely transparent cover. Thus, guests can enjoy a spectacular view of the city sitting in a warm and cozy dome tent.